A little sweet and a little spicy perfect blend of flavors! 1 Cut onion and beef into thin strips (beef should be bite size). 2 Add two tablespoons oil to hot pan or wok. 3 When oil is hot and swirly, add garlic and onions. Cook two minutes or until onion is lightly browned. 4 Add florets and cook two minutes. 5 Add sirloin and stir fry until cooked through. Don't overcook or florets will be mushy! 6 Meanwhile, Combine sherry, cornstarch and soy. 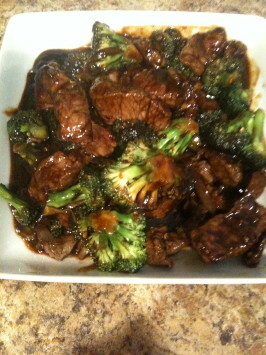 7 Turn heat off and drizzle honey all over stir fry. Add soy mixture and stir. 8 Stir in red pepper.